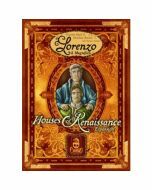 In Lorenzo il Magnifico, each player takes the role of a head of a noble family in a city during the Italian renaissance. You try to accumulate prestige and fame to gain more victory points (VP) than the others. To do so, you send your family members to different areas of town, where they can obtain many achievements. In one location they get useful resources, in another development cards (which represent newly conquered territories, sponsored buildings, influenced characters, or encouraged ventures), somewhere else they activate the effects of their cards.